Khartoum — A large proportion of ATMs in Khartoum state have been out of service for more than two weeks, making it difficult for people to access their February salaries. Long queues form in front of banks every day; however this does not guarantee the receipt of any cash. Bankers lay the blame for the crisis at the door of the Central Bank of Sudan, which has stopped feeding them with cash. The banks expected the continuation of the liquidity crisis until the end of March, and express hopes of a return to service in early April. As reported by Radio Dabanga last week, the inflation rate in Sudan rose to 44.29 per cent in February - a month-on-month rise of 1.93 per cent from January. The Central Bank of Sudan (CBoS) has directed some banks not to feed their ATMs with cash and stop the transfer of balances by telephone. 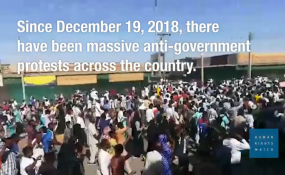 The Sudanese Pound has continued to drop against the US Dollar, against the backdrop of ongoing demonstrations calling for the step-down of President Al Bashir and his regime from power, which were sparked by bread and fuel shortages in Atabara on 13 December 2018. The printing of new currency by the CBoS has been necessitated by hyperinflation, coupled with a chronic shortage of hard cash. Cash withdrawals from ATMs are also severely restricted. As a result of the cash shortage, much of the available currency is in circulation and kept by people at home rather than deposit it into banks from where it is difficult to retrieve. A number of patients have complained about the lack of medication for allergy, asthma, epilepsy, and most psychiatric medicines. They pointed out that the factories operating in the country provide only 30 per cent of the medicine needs of the Sudan, while 70 per cent must be imported from abroad. They proposed to abolish the monopoly of importing proprietary medicines in favour of non-commercial generic medicines, and to stop the import of any medicine from abroad if there are similar medicines manufactured locally. The Central Pharmacists Committee told Radio Dabanga last week that the country will face an even worse medicine crisis in the next few weeks because a number of the companies involved in the import of medicine are planning to stop the import of medicines to Sudan until further notice because of the rise of the Dollar prices.